What have I been doing for the past 3 years? After I completed my undergraduate and graduate in architecture school, I started working at OMNIPLAN. During my time here, I have also been studying to be a licensed architect! My friends who are not in the architecture were surprised, “Aren’t you an architect when you graduate from architecture school?” Unfortunately no, legally I could not call myself an architect, until I had gone through the rigorous process of completing my intern development hours and taking my licensing exams. These licensing exams are known as the ARE’s (Architect Registration Exam) and are taken after finishing formal education. So, for the past 3 years, I have been working towards taking the ARE 4.0—which consists of seven exams that test your knowledge of construction materials, systems, structures, programming, contracts, site design and construction documents. Ever since I graduated from school, I have found that my attention span for studying has diminished—probably to the length of a squirrel’s. So, when I first started preparing for the ARE’s while working full time; I had to find creative ways to focus. One of the best methods for me was to find a place where I couldn’t get distracted. This usually meant finding a local coffee shop and forcing myself to remain “unplugged” (no Internet). I would bring my handy “study bag” that was vital in helping me stay organized while studying. What was in this study bag? -- I thought you’d never ask! Seriously? I probably haven’t bought a binder for studying, since I was in high school. My time in architecture school was very much a project-oriented lifestyle, so I was used to buying sketchbooks, drafting dots, and modeling building equipment. However, going back to the basics with a binder helped me keep all my papers together. Usually, for each exam I started a new binder—which would be chocked full of test questions, diagrams, notes and sometimes AIA contract documents. Having a place where I could put everything gave structure and discipline to the chaotic process of taking seven exams. I have always loved books but I’ll admit that it’s a little harder to love study books. However, I thrive best when I have a physical book in front of me where I can bookmark important sections, highlight key information and write in the margins. Some people have found iPads to be very helpful in studying, but I love the tangible grittiness of paper and making the study text my own. Many of the books I studied were borrowed, so I couldn’t actually write directly in the book. However, I used post-it notes so I could write down key information in the book. 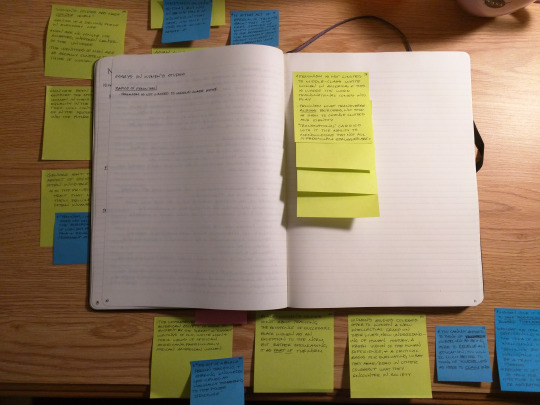 When I was finished reading the book, I would then take out all my post-it notes and transfer them into a notebook. It seems like an odd system, but it helped me at the time. Part of being an architect is having a slight addiction to office supplies. I have always loved writing utensils—so bringing all types of pens, pencils and highlighters in my study bag definitely helped! When working on practice test questions, sometimes I would have to solve simple math equations. I would bring out my old calculators (the beloved Texas Instruments type), and use them for simple calculations to simulate the experience of using a computer’s calculator. Some people can study in complete silence. However, I am not one of those people. I really enjoy the white noise of people chatting and coffee being made. However, when the headphones went in my ears, I knew it was time to get down to business. Most of the time I’d listen to old college-day playlists, and pretend I was back in the studio at Goldsmith Hall (UT Austin’s architecture building). It was a sweet time to reconnect with bands such as Death Cab for Cutie and Coldplay. Leonard Bernstein said, “To achieve great things, you need a plan and not quite enough time.” Like most architects, I am able to get much more done if I see a deadline looming over my head. Therefore, I’d create a calendar to figure out when to schedule my next exam and how many days I had remaining to study. This kept me actively engaged on the days I didn’t want to study. It could be pretty stressful when I would count down the days, but it always gave me a sense of urgency in the process.